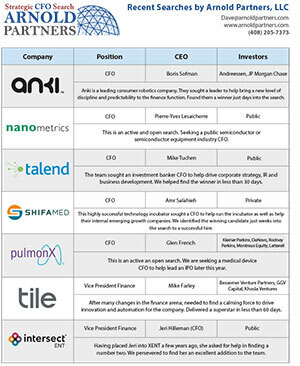 Arnold Partners is the leading, independent CFO search firm for technology companies nationwide. Their placed CFOs helped their clients grow by an aggregate of $11 billion in value in the last nine years. If you’re not sure where to get started, don’t worry – Arnold Partners is happy to provide you with clear, concise videos about how to hire a CFO. This ensures that even on your busiest days you can learn how to improve how your business is running. Sometimes job titles can be a little confusing or even misleading. In this video, Dave Arnold differentiates between a “headhunter” and an executive search consultant who serves as a management consultant. In this CFO search video, Dave Arnold identifies 3 critical questions you should ask an executive search firm before getting started. There’s always more research that needs to be done, so make sure you’re doing it right. Watch this video to learn 3 additional questions Dave Arnold believes you should ask an executive search firm. The best problems are ones that never show up! Dave Arnold talks about taking a “moonshot” in executive search (attracting candidates believed to be slightly out of the league for the client’s current situation). He believes the rewards are worth the risk. It’s hard to climb to the top without strong guidance and to get that, you need to ask the right questions. In this video, Dave Arnold reveals the questions that one of the all-time great venture investors asks executive candidates and the greater importance of references. Dave Arnold gives seasoned advice on how to network yourself into a new opportunity, whether you’re looking for your first career opportunity or first board seat.